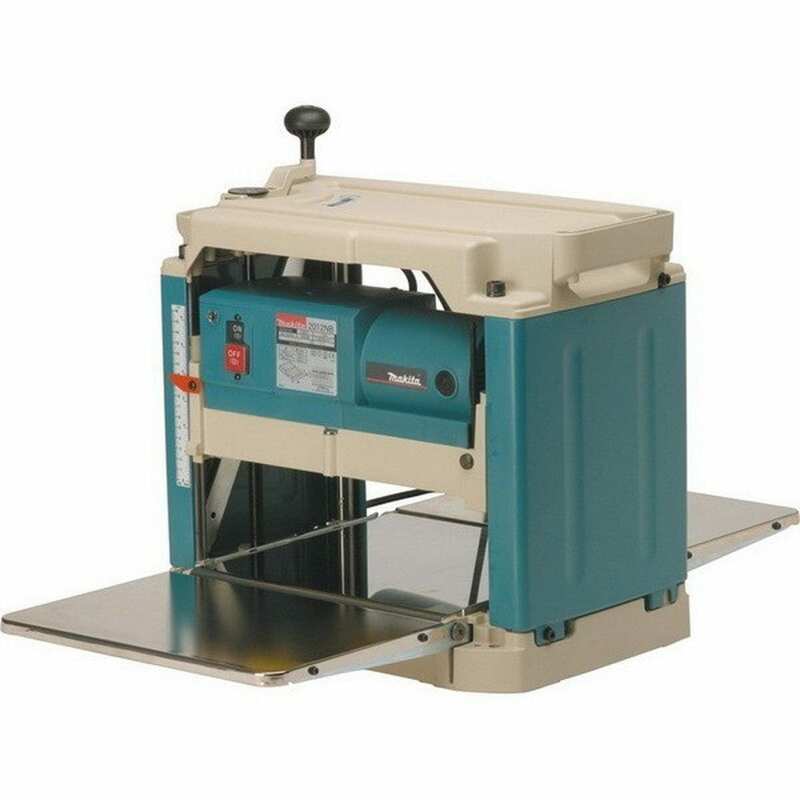 The Makita 2012NB 12-Inch Planer with Interna-Lok Automated Head Clamp is a great choice for both wood planer connoisseurs as well as the occasional newbie, keen on remodeling the kitchen on his own. It is a very easy to use planer and the Interna-Lok head clamp comes as a great added feature. It’s quite light and I do think it’s a good investment if you are looking for something a lot more portable, great for taking on on-site trips. However, considering the wide and conflicting information all around the web, I decided to take some time and write this guide and review. I do hope this will help shed some light on the real Makita, not the low-rating one people invented because their packages arrived a little bit damaged. Packaging and transport is one thing, machine quality is another (check for the lowest price on the Makita 2012NB). As any carpenter will let you know, at least one worth his money, a final piece is only good as the material it’s made out of. If you don’t think this is true you will change your mind. Learning curves are quite steep here. This is why, although a bit of an expensive purchase for some, especially if you are not using it to make a living, wood planers are a quintessential carpenter’s tool. As a freelance carpenter, I pride myself on working quite a lot with reclaimed wood, not the most uniform material, both in regards to surface and strength. A planner will thin the board out without any problem. I find the Makita great for completing my tool collection, but then again I am a professional and have a few more such tools, some heavier and more industrial-looking. However, I do recommend this model to even the occasional DIY aficionado ad it is quite easy to use, very compact and high-quality. Its many features work just as smoothly as they should – do not let its smaller size deter you. No matter if you are a professional, full-time or not, or just curious to know if you could do all the kitchen remodeling by yourself, I suggest you give the Makita a check. A good planer will live you with a fine finish regardless of the wood you use and it will allow you to work cheaper and faster. Now, you might not think the Makita is the model for you. Which is perfectly alright. However, you do have to know about some of the key features you have to look for, mainly if you are a beginner that is. Though we have to say, this was not exactly a deal-breaker for me, at least as much as I previously thought. This has maybe something to do with the fact that most planers nowadays are actually pretty good. However, if this is an important factor for you, do make sure you invest in one that can cut even some of the hardest wood varieties around. As there isn’t any planner on the face of the earth that doesn’t generate a fair amount of chips and dust, a good collection system is key here. I personally prefer to get a planer with an incorporated fan that will instantly blow any debris away from the cutter-head. Before investing in any model, make sure you do your homework, just as much as I did and be sure that it has gauges in all the right places that will stop you from biting too much into any piece. Now, the Makita, as well as many other models in the same category do have double-edged, self-indexing knives. This will save you a lot of drama and potential hassle. This lock feature will prevent the head from rotating while you find yourself in the process of removing knives and bolts. You will be grateful in the long run. This model from Makita is pretty compact and extremely low noise, 2 features that many people would appreciate I am sure. The blades are easily changed and the depth stop is quite adjustable. No room for mistakes here. One of the key aspects as to why I like this model is the fact that, in addition to having a 4-post design complete with some diagonal cross supports for a greater stability, it also comes complete with large table extensions. Now, depending on your actual work piece’s size, you might not need them, however, I think they are essential for larger panels. The motor has a no load speed of about 8,500 rotations/ minutes and it is by far the quietest one in its entire class, coming up at only 83dB. As previously mentioned, the 4 post design and diagonal cross do wonders for its overall stability and the large tables support a bigger workpiece beautifully. The 2012NB model has a feed rate of 28 feet/ minute and a maximum thickness of 6-3/32 inches. Here, I have to mention the LED light that indicates if the planer is either connected or not to the power source and that the large paddle is off/ on. Also, the fact that it is quite lightweight, at least when compared to other models in its class, is a much-needed bonus for many. Another functional and easy to use feature are the disposable double-edged blades, very easy to change. No hassle her. This much-discussed about feature is actually an automated head clamp that helps eliminate any snipe and improve the entire planning process. Though I had been working with wood planers from other brands before, I was really intrigued by the Makita after seeing it in the workshop of a colleague. I was a bit on the fence however…I mean, do I really need another toy? Didn’t I have enough planers in the shop? I decided to look some more into this particular model before either buying it or rejecting the idea completely. As it’s the case with every single product on the face of the planet, this one also had countless reviews, some good, some bad and some just in between. I mean, there were a few hundred reviews all around the internet, all waiting to help shed some light on the Makita. Many users did say that this model is ideal for working with both hard and soft wood, leaving a lovely finish an all pieces, and there were those who actually enumerated oak, red and white, as well as hickory in their comment. On the downside, there were some people stating that they had a problem with the fact that there is no heat sensor and that when working, the Makita does tend to turn really hot. On a better note, it does take about two 2 x 6 pine boards at a time, at least according to a previous buyer that has had apparently planned over 1000 feet of boards at the review time. This was great news to me as this user apparently didn’t have any problem with the machine overheating. Great news indeed…as I really wanted to get one now. And while there were some people who apparently has some issues with either the blades, dust collector, feed roller, dust boot outlet, you name it. But as one user put it, you do have to put in a little work into properly maintaining the Makita. After a few afternoons scouring the internet for reviews and a few Advil, I have to admit, decided to buy the Makita after all as some of the worst reviews seemed a little off, at least to me. I mean, if the people who gave it 5 stars fouls something they were annoyed about why couldn’t those that utterly hated it find something they like? However, since I know some of you might still be on the fence regarding the Makita, I have gathered some other planers as alternative choices. Some I have used, mainly Dewalt models and I really love the quality and performance, and some were choices, made on what other carpenters I know use. In my eyes, you cannot go wrong with a Dewalt model, and this 13-inch one is pretty good. I have it in my shop and find it leaves even the worst of reclaimed wood boards in top shape. The 15-AMP motor with 20,000 RPM and a cutter head speed of 10,000 RPM will do any work no matter how hard the wood piece is. What I personally love, and you will too, is that the three-knives of the cutter head have a longer life (about 30% more) while being also extremely easy to use. The incorporated fan-assisted ejection system is a nice addition, not just in my book, but also in that of many reviewers. Though I do not personally own it, I have to incorporate this model from Delta in the alternatives shortlist based on the reviews of friends and colleagues. Coming with a 15Amp motor and a 4-column design, the Delta will be of great help in the workshop, especially thanks to the good amount of stability it provides. The adjustable infeed and out-feed tables it is equipped with are also quite a nice addition. That being said, what really sets this model apart from all the others is the fact that it is really light. With only 58 pounds in weight, this wood planner is really easy to take around with you on-site. Keep in mind that a small size does not equal a week machine however. This lovely Grizzly model is as durable and high-performance as its name suggests. Coming equipped with a deflector shield, this machine is as secure as it is high-quality. Most previous users do like it, mainly as it is made out of steel. Yes this is on the heavier side (78 pounds), trust me I am aware, I own it. However, the fact that it allows you to work with both measurement systems will take away from any potential inconvenience. It is well worth a try. Now, this third option is a model from WEN. What stands this wood planer apart is its granite tables, providing quite a sturdy, smooth surface for wood to travel on. The 15Amp motor is also very powerful, generating about 18,800 cuts/ minute at a good feed rate of 26 feet/ minute. Pretty good stats I have to say. The plane boards are about 12.5 inches wide and up to 6 inches thick, goo measurements for most people. What I have to say I like most about this planer is the fan-assisted debris removal system. Very high-functioning, and you will love this feature. Considering the fact that I actually own quite a few planers in my shop, the Makita seemed a bit of an unnecessary toy to buy. I mean, yeah, it’s great at what it does, but so what? All my other wood planners were also great. Well, not without any self-search, I decided to buy the damn thing. Now, its quality is top-notch as with most, if not all Japanese products. After reading all the reviews, and tips and tricks, I decided to put it up to a test, so I ran a few thousand feet of Brazilian Walnut, the toughest wood I had on hand, and it worked perfectly great. Its size doesn’t take away from its power whatsoever. As for the potential problems some users say they experienced, I took notice and will perform periodic maintenance sessions. But…I already do that with all my tools as everyone should. Now, for me, this is an ideal purchase to complete my collection of heavier models. This will also work beautifully as a first-time planner for many. I tend to purchase my products online where I'm able to compare and find the best prices. For the best prices on the Makita 2012NB, click here - I hope this review was useful for you!